Something was horribly wrong with the full-page ad for an upcoming exhibition about the Auschwitz death camp. It appeared yesterday on Holocaust Remembrance Day. I know the folks behind the ad meant well. But really . 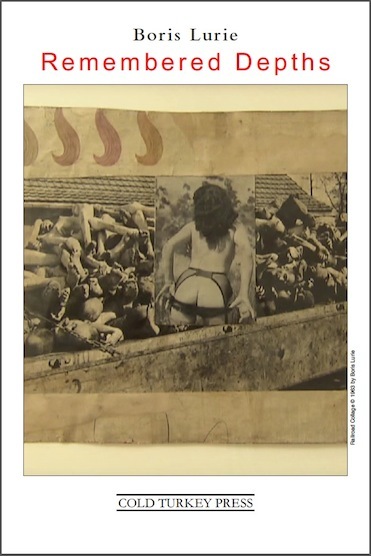 . . Auschwitz and the art of advertising are a nauseating mix. Here’s the unthinking kicker which caught my eye beneath the infamous photo that hugely illustrates the ad. The complete ad with the photo only makes it worse. This would seem to play directly into the hands of Norman Finkelstein’s 2000 book The Holocaust Industry: Reflections on the Exploitation of Jewish Suffering. Even if Finkelstein’s book has some weaknesses, he also makes some valid points. The big problem is that if one gives Finkelstein an inch, anti-Semites will take a mile. So what is the best approach to things like that astounding ad? Minds far better than mine have argued that the Holocaust is unique, that it can hardly be addressed because it was and still is beyond comprehension. It is thus argued that almost any attempt to address the Holocaust will by necessity be reductive and even a trivialization. The Holocaust, it is argued, is an extremity of evil for which we have no language or even cognitive ability. And yet we cannot be silent. Another approach to this ad might be Baudrillard’s idea that in our media-centric culture much of reality becomes a simulacrum — representations that spiral so deeply in ever-repeated self-referential memes that they lose their basis in reality. Or alternatively, our sense of the world is seen through the lens of the media and thus becomes only a simulation of reality — a matrix we see because we swallowed the blue pill, as it were. These two ideas are brought together if we accept that Holocaust is beyond comprehension, and that our only approaches to it can be through simulacrums, i.e. artifacts that represent the Holocaust but are not actually connected to it, And through simulations such as Holocaust museums so reductive that they lose the actual reality of horrors that in any case can have no representation. These simulara and simulations thus define the cheesy artificiality of mass culture until they become so ubiquitous that they define reality itself. 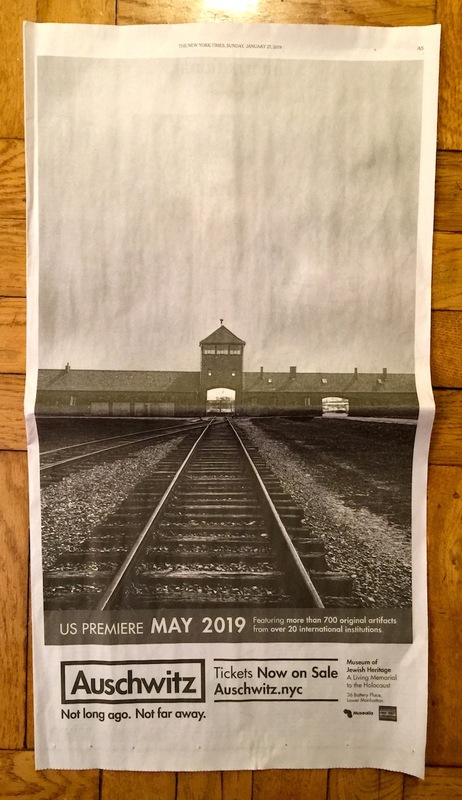 Promotion for the Auschwitz exhibit falls into the hands of an advertising agency and we see a McAuschwitz ad in the NYT. Under these circumstances, the dangers of the Holocaust being instrumentalized can indeed become a problem. Form there we arrive back at the No!Art of Boris Lurie, the idea that representations or conceptualizations of the Holocaust can only be a grotesque parody. He seems to follow this to its logical conclusion and consciously represents the Holocaust only through grotesque parody, a vulgarity beyond the nature of language and representation itself. The difference is that unlike that ad, Lurie consciously uses this irony. And then comes the irony that I am foolishly overthinking things for which there will never be any answers. Your simple commentary and clip of the ad says far better what needs to be said. This entry was posted on 2 February, 2019 in homepage and tagged Holocaust Remembrance Day, Jan Herman. Bookmark the permalink.